We previously noted the high corrosivity of Flint River water to iron pipe, and the higher incidence of red water and pipe leaks as a result, when compared to the use of Detroit water. At the time, we also mentioned that the Flint River water is much more corrosive to lead plumbing. Scientifically, this is because Flint River has much higher chloride content, which leaches lead from plumbing materials into drinking water. Test 3 was conducted, to see if adding orthophosphate to Flint River water would stop lead corrosion. The first thing we noticed was that waters in Test 2 and Test 3 (with Flint River water added) started turning white because of significantly high lead corrosion occurring in them (Figure 1, left). 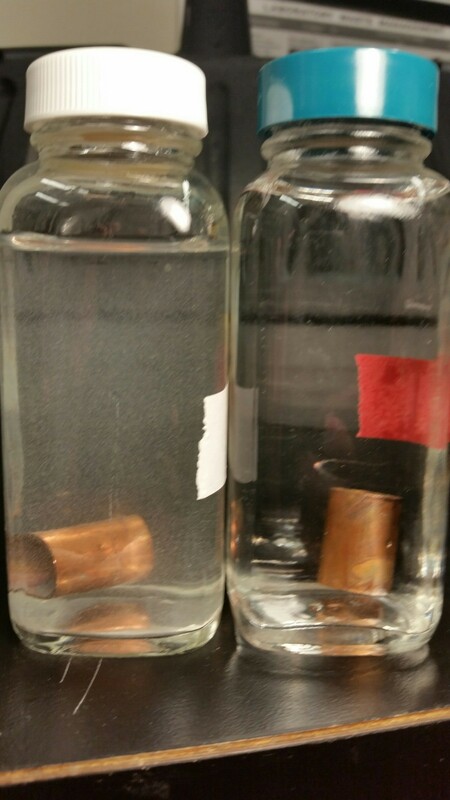 In contrast, Detroit water in the exact same test (Test 1) remained clear (Figure 1, right). Three identical tests are currently being run for aforementioned Tests 1-3 to provide replication increase confidence in the results (only two containers shown in Figure 1). We then collected water samples from every container at the end of Weeks 1 and 2. This means, for each test we took a total of 6 samples. We then used statistics to see what conclusions we could make with confidence. The Detroit water is clearly much less corrosive to lead solder than the Flint River water. On average, Detroit water is 12 times (or 12X) less corrosive than the Flint River water currently in use. That is, the current Flint River water leaches 12X more lead to the water than Detroit water. This explains why the lead in Flint’s water in our survey, is so high, even when it was low before when Detroit water was being used. Unfortunately, it does not look like orthophosphate is helping to stop lead leaching when in contact with Flint River water, which is also consistent with expectations based on experiments in high chloride water. 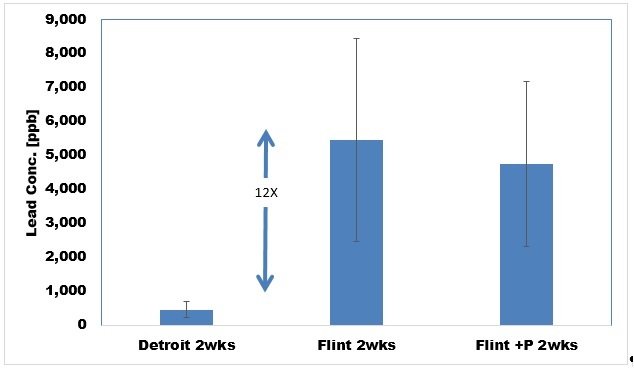 There is a slight improvement, but even with phosphate, Flint River water has 10 times more lead compared to the same condition using Detroit water. We will continue to run these tests to see if orthophosphate starts reducing the lead present in the test with Flint River water. Conclusion: On a scientific basis, Flint River water leaches more lead from plumbing than does Detroit water as predicted before. This is creating a public health threat in some Flint homes that have lead pipe or lead solder. Unfortunately, adding orthophosphate corrosion inhibitor to the Flint River water, does not solve the lead problem (at least based on the first two weeks of testing).